The history of Christianity is the history of the Christian religion and the Christian church, from Jesus and his apostles to our times. Christianity is the monotheistic religion that is based on the life and teaching of Jesus. Christianity began in the 1st century AD as a Jewish sect but quickly spread throughout the Greco-Roman world. Although it was originally persecuted under the Roman Empire, it became the state religion in the end. In the Middle Ages it spread into Northern Europe and Russia. During the Age of Exploration, Christianity expanded throughout the world; it is the largest religion of the world. The religion had schisms and theological disputes that had as result three main branches: the Roman Catholic Church, the Eastern Orthodox churches, and Protestant churches. Most of the first Christians were ethnically Jewish or Jewish proselytes. An early difficulty came from non-Jewish converts. There was the question if they had to "become Jewish" before becoming Christian. The decision of St. Peter, was that they did not, and the matter was further addressed with the Council of Jerusalem. The doctrines of the apostles brought the Early Church into conflict with some Jewish religious authorities, and this eventually led to the martyrdom of SS. Stephen and James the Great and expulsion from the synagogues. Thus, Christianity got an identity distinct from Judaism. The name "Christian" (Greek Χριστιανός) was first used for the disciples in Antioch, as recorded in (Acts 11:26; Acts 11:26). The sources for the beliefs of the apostolic community include the Gospels and New Testament Epistles. The very earliest reports are in these texts: early Christian creeds and hymns and reports about the Passion, the empty tomb, and appearances of Jesus after his Resurrection. There reasons to suppose that they were written within a few years of the crucifixion of Jesus and came from the Jerusalem Church. Christianity kept many practices from Jewish tradition. Christianity thought the Jewish scriptures to be sacred and used mostly the Septuagint edition and translation as the Old Testament, and added other texts as the New Testament canon developed. Christians professed Jesus to be the God of Israel, having taken human form, and considered Jesus to be the Messiah (Christ) who had been prophesied about in the Old Testament and so was expected by the people of Israel. Christianity also continued other Judaic practices: liturgical worship, including the use of incense, an altar, a set of scriptural readings adapted from synagogue practice, use of sacred music in hymns and prayer, and a religious calendar, as well as other typical features: an exclusively male priesthood, and practices (fasting etc.). The time when most of the apostles had died and their jobs as leaders of the Christian communities in the cities had been taken over by bishops, is called post-apostolic period. It includes the time of persecutions until Christian worship was legalized under Constantine the Great. The earliest recorded use of the term Christianity (Greek Χριστιανισμός) is from this period. The term was used by Ignatius of Antioch c. 107. Until the late fourth century, when they became the dominant political force of the Roman Empire (and by consequence the entire Mediterranean), Christians were subject to various persecutions. This meant even death. That was the case with Stephen (Acts 7:59) and James, son of Zebedee (Acts 12:2). Persecutions in lager scale by the authorities of the Roman Empire, began with the year 64, when the Emperor Nero blamed them for the great Fire of Rome as the Roman historian Tacitus reported. According to Church tradition, it was under Nero's persecution that the saints Peter and Paul became martyrs in Rome. Similarly, several of the New Testament writings mention persecutions and that they had very difficult times. For 250 years there were times when Christians suffered from persecutions, because they refused to worship the Roman emperor. That was seen as treason and punished by execution. But the Christian religion continued to spread throughout the Mediterranean region. Galerius issued an edict permitting the practice of the Christian religion under his rule in April of 311. In 313 Constantine I and Licinius announced toleration of Christianity in the Edict of Milan. Constantine became the first Christian emperor. By 391, under the reign of Theodosius I, Christianity had become the state religion of Rome. The Emperor Constantine I had learnt about Christianity of his mother, Helena. But it is not clear if he adopted his mother's humble Christianity in his youth, or if he adopted it later on in his life. When Christianity was legalized the Church took the same provinces for administration as the imperial government and called them dioceses. The Bishop of Rome claimed to be the highest amongst all others and chose the title pope. During this era, there were several Ecumenical Councils. These were mostly concerned with Christological disputes. The two Councils of Niceaea (324, 382) condemned the Arian heresy and produced a creed (see Nicene Creed). The Council of Ephesus condemned Nestorianism and affirmed the Blessed Virgin Mary to be Theotokos ("God-bearer" or "Mother of God"). Perhaps the most important council was the Council of Chalcedon that affirmed that Christ had two natures, fully God and fully man, at the same time. That meant that Monophysitism was condemned. The Church in the Early Middle Ages saw a "transformation of the Roman world" rather than a "fall of the Roman Empire". With the Muslim invasions of the seventh century, the Western (Latin) and Eastern (Greek) areas of Christianity began to take on distinctive shapes, and the Bishops of Rome were more interested in barbarian kings than in the Byzantine Emperors. This led to the coronation of Charlemagne as "Emperor of the Romans" by Pope Leo III in Rome on Christmas Day, 800. The city of Rome was affected very much by warfare in Italy during the Early Middle Ages. Emperor Justinian I tried to restore imperial dominion in Italy against the gothic aristocracy. The following campaigns were more or less successful, and the Imperial Exarchate was established in Ravenna for Italy, but imperial influence was often limited. Then came the invasion of the Lombards, and Rome had to take care of itself. Thus the popes, out of necessity, found themselves feeding the city with grain from papal estates, negotiating treaties, paying protection money to Lombard warlords, and, failing that, hiring soldiers to defend the city. Eventually, the failure of the Empire to send aid resulted in the popes turning for support from other sources, most especially the Franks. The High Middle Ages is the period from the coronation of Charlemagne in 800 to the close of the fifteenth century, which saw the fall of Constantinople (1453), the end of the Hundred Years War (1453), the discovery of the New World (1492), and thereafter the Protestant Reformation (1515). The Investiture Controversy, also known as the lay investiture controversy, was the most important conflict between secular and religious powers in medieval Europe. It began as a dispute in the 11th century between the Holy Roman Emperor Henry IV and Pope Gregory VII. The question was who would control appointments of bischops (investiture). The end of lay investiture meant an important loss of royal power, for the benefit Church reform, as the pope intended, and for ambitious noblemen as well. Pope Gregory VII issued the Dictatus Papae, which declared that the pope alone could appoint or depose bishops, or translate them to other sees. Henry VI's rejection of the decree lead to his excommunication and a ducal revolt; eventually Henry received absolution after dramatic public penance barefoot in Alpine snow and cloaked in a hairshirt (see Walk to Canossa), though the revolt and conflict of investiture continued. Likewise, a similar controversy occurred in England between King Henry I and St. Anselm, Archbishop of Canterbury, over investiture and ecclesiastical revenues collected by the king during an episcopal vacancy. The English dispute was resolved by the Concordat of London, 1107, where the king renounced his claim to invest bishops but continued to require an oath of fealty from them upon their election. This was a partial model for the Concordat of Worms (Pactum Calixtinum), which resolved the Imperial investiture controversy with a compromise that allowed secular authorities some measure of control but granted the selection of bishops to their cathedral canons. As a symbol of the compromise, lay authorities invested bishops with their secular authority symbolized by the lance, and ecclesiastical authorities invested bishops with their spiritual authority symbolized by the ring and the staff. The Crusades were a military conflicts conducted by Christian knights for the defense of Christians and for the expansion of Christian domains. Generally, the crusades refer to the campaigns in the Holy Land against Muslim forces sponsored by the Papacy. There were other crusades against Islamic forces in southern Spain, southern Italy, and Sicily, as well as the campaigns of Teutonic knights against pagan strongholds in Eastern Europe, and (to a much lesser extent) crusades against Catharism or other Christian heresies. The Holy Land had been part of the Roman Empire, and thus Byzantine Empire, until the Islamic conquests of the seventh and eighth centuries. Thereafter, Christians had generally been permitted to visit the sacred places in the Holy Land until 1071, when the Seljuk Turks closed Christian pilgrimages and assailed the Byzantines, defeating them at the Battle of Manzikert. Emperor Alexius I asked for aid from Pope Urban II (1088-1099) for help against Islamic aggression. Instead of sending money, Urban II called upon the knights of Christendom in a speech made at the Council of Clermont on 27 November 1095, combining the idea of pilgrimage to the Holy Land with that of waging a holy war against infidels. The East-West Schism, or Great Schism, separated the Church into Western (Latin) and Eastern (Greek) branches, i.e. Western Catholicism and Eastern Orthodoxy. It was the first major division since certain groups in the East rejected the decrees of the Council of Chalcedon (see Oriental Orthodoxy), and was far more significant. Though normally dated to 1054, the East-West Schism was actually the result of an extended period of estrangement between Latin and Greek Christendom over the nature of papal primacy and certain doctrinal matters like the filioque, but intensified by cultural and linguistic differences. The "official" schism in 1054 was the excommunication of Patriarch Michael Cerularius of Constantinople, followed by his excommunication of papal legates. Attempts at reconciliation were made in 1274 (by the Second Council of Lyon) and in 1439 (by the Council of Basel), but in each case the eastern hierarchs who consented to the unions were repudiated by the Orthodox as a whole, though reconciliation was achieved between the West and what are now called the "Eastern Rite Catholic Churches". More recently, in 1965 the mutual excommunications were rescinded by the Pope and the Patriarch of Constantinople, though schism remains. Both groups are descended from the Early Church, both acknowledge the apostolic succession of each other's bishops, and the validity of each other's sacraments. Though both acknowledge the primacy of the Bishop of Rome, Eastern Orthodoxy understands this as a primacy of honor with limited or no ecclesiastical authority in other dioceses. The Western Schism, or Papal Schism, was a prolonged period of crisis in Latin Christendom from 1378 to 1416, when there were two or more claimants to the See of Rome and thus it was difficult to discern who the true Pope was. The conflict was political, rather than doctrinal, in nature. The Renaissance was a period of great cultural change and achievement, marked in Italy by a classical orientation and an increase of wealth through mercantile trade. The City of Rome, the Papacy, and the Papal States were all affected by the Renaissance. On the one hand, it was a time of great artistic patronage and architectural magnificence, where the Church patroned such artists as Michelangelo, Brunelleschi, Bramante, Raphael, Fra Angelico, Donatello, and da Vinci. On the other hand, wealthy Italian families often secured episcopal offices, including the papacy, for their own members, some of whom were known for immorality, such as Alexander VI and Sixtus IV. 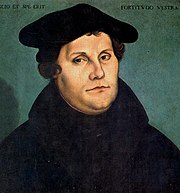 In the early 16th century, movements were begun by two theologians, Martin Luther and Ulrich Zwingli, that aimed to reform the Church; these reformers are distinguished from previous ones in that they considered the root of corruptions to be doctrinal (rather than simply a matter of moral weakness or lack of ecclesiastical discipline) and thus they aimed to change contemporary doctrines to accord with what they perceived to be the "true gospel". The Protestant Reformation is so called because the movement's leaders "protested" against the ecclesiastical hierarchy and the pope, essentially electing to institute their reforms separately from it. The term "Protestant", however, was not originally used by these leaders; instead, they called themselves "evangelical", emphasizing the "return to the true gospel (Greek: euangelion)". The beginning of the Protestant Reformation is generally identified with Martin Luther and the posting of the 95 Theses on the castle church in Wittenburg, Germany. Early protest was against corruptions such as simony, episcopal vacancies, and the sale of indulgences. The Protestant position, however, would come to incorporate doctrinal changes such as sola scriptura and sola fide. The three most important traditions to emerge directly from the Protestant Reformation were the Lutheran, Reformed (Calvinist, Presbyterian, etc. ), and Anglican traditions, though the latter group identifies as both "Reformed" and "Catholic", and some subgroups reject the classification as "Protestant". The Protestant Reformation may be divided into two distinct but basically simultaneous movements, the Magisterial Reformation and the Radical Reformation. The Magisterial Reformation involved the alliance of certain theological teachers (Latin: magistri) such as Luther, Huldrych Zwingli, John Calvin, Cranmer, etc. with secular magistrates who cooperated in the reformation of Christendom. Radical Reformers, besides forming communities outside state sanction, often employed more extreme doctrinal change, such as the rejection of tenants of the Councils of Nicaea and Chalcedon. Often the division between magisterial and radical reformers was as or more violent than the general Catholic and Protestant hostilities. The Protestant Reformation spread almost entirely within the confines of Northern Europe, but did not take hold in certain northern areas such as Ireland and parts of Germany. By far the magisterial reformers were more successful and their changes more widespread than the radical reformers. The Catholic response to the Protestant Reformation is known as the Counter Reformation, or Catholic Reformation, which resulted in a reassertion of traditional doctrines and the emergence of new religious orders aimed at both moral reform and new missionary activity. The Counter Reformation reconvered approximately 33% of Northern Europe to Catholicism and initiated missions in South and Central America, Africa, Asia, and even China and Japan. Protestant expansion outside of Europe occurred on a smaller scale through colonization of North America and areas of Africa. Martin Luther was an Augustinian friar and professor at the University of Wittenberg. In 1517, he published a list of 95 Theses, or points to be debated, concerning the illicitness of selling indulgences. Luther had a particular disdain for Aristotelian philosophy, and as he began developing his own theology, he increasingly came into conflict with Thomistic scholars, most notably Cardinal Cajetan. Soon, Luther had begun to develop his theology of justification, or process by which one is "made right" (righteous) in the eyes of God. In Catholic theology, one is made righteous by a progressive infusion of grace accepted through faith and cooperated with through good works. Luther's doctrine of justification differed from Catholic theology in that justification rather meant "the declaring of one to be righteous", where God imputes the merits of Christ upon one who remains without inherent merit. In this process, good works are more of an unessential byproduct that contribute nothing to one's own state of righteousness. Conflict between Luther and leading theologians lead to his gradual rejection of authority of the Church hierarchy. In 1520, he was condemned for heresy by the papal bull Exsurge Domine, which he burned at Wittenburg along with books of canon law. John Calvin was a French cleric and doctor of law turned Protestant reformer. He belonged to the second generation of the Reformation, publishing his theological tome, the Institutes of the Christian Religion, in 1536 (later revised), and establishing himself as a leader of the Reformed church in Geneva, which became an "unofficial capital" of Reformed Christianity in the second half of the sixteenth century. He exerted a remarkable amount of authority in the city and over the city council, such that he has (rather ignominiously) been called a "Protestant pope". Calvin established an eldership together with a "consistory", where pastors and the elders established matters of religious discipline for the Genevan population. Calvin's theology is best known for his doctrine of (double) predestination, which held that God had, from all eternity, providentially foreordained who would be saved (the elect) and likewise who would be damned (the reprobate). Predestination was not the dominant idea in Calvin's works, but it would seemingly become so for many of his Reformed successors. Unlike other reform movements, the English Reformation began by royal influence. Henry VIII considered himself a thoroughly Catholic King, and in 1521 he defended the papacy against Luther in a book he commissioned entitled, The Defense of the Seven Sacraments, for which Pope Leo X awarded him the title Fidei Defensor (Defender of the Faith). However, the king came into conflict with the papacy when he wished to annul his marriage with Catherine of Aragon, for which he needed papal sanction. Catherine, among many other noble relations, was the aunt of Emperor Charles V, the papacy's most significant secular supporter. The ensuing dispute eventually lead to a break from Rome and the declaration of the King of England as head of the English (Anglican) Church. England then experienced a period of frenetic and eclectic reforms, some more radical and others more traditional, under monarchs such as Edward VI and Elizabeth I, and Archbishops of Canterbury such as Thomas Cranmer and William Laud. What emerged was a state church that considered itself both "Reformed" and "Catholic" but not "Roman" (and hesitated from the title "Protestant"), and other "unofficial" more radical movements such as the Puritans. Though Ireland, Spain, France, and elsewhere featured significantly in the Counter-Reformation, its heart was Italy and the various popes of the time, who established the Index Librorum Prohibitorum (the list of prohibited books) and the Roman Inquisition, a system of juridical tribunals that prosecuted heresy and related offences. The Papacy of St. Pius V (1566-1572) was known not only for its focus on halting heresy and worldly abuses within the Church, but also for its focus on improving popular piety in a determined effort to stem the appeal of Protestantism. Pius began his pontificate by giving large alms to the poor, charity, and hospitals, and the pontiff was known for consoling the poor and sick, and supporting missionaries. The activities of these pontiffs coincided with a rediscovery of the ancient Christian catacombs in Rome. As Diarmaid MacCulloch stated, "Just as these ancient martyrs were revealed once more, Catholics were beginning to be martyred afresh, both in mission fields overseas and in the struggle to win back Protestant northern Europe: the catacombs proved to be an inspiration for many to action and to heroism." The First Great Awakening was a wave of religious enthusiasm among Protestants in the American colonies c. 1730-1740, emphasizing the traditional Reformed virtues of Godly preaching, rudimentary liturgy, and a deep sense of personal guilt and redemption by Christ Jesus. Historian Sydney E. Ahlstrom saw it as part of a "great international Protestant upheaval" that also created Pietism in Germany, the Evangelical Revival, and Methodism in England. It centered on reviving the spirituality of established congregations, and mostly affected Congregational, Presbyterian, Dutch Reformed, German Reformed, Baptist, and Methodist churches, while also spreading within the slave population. The Second Great Awakening (1800–1830s), unlike the first, focused on the unchurched and sought to instill in them a deep sense of personal salvation as experienced in revival meetings. It also sparked the beginnings of Restorationist groups such as the Mormons and the Holiness movement. The Third Great Awakening began from 1857 and was most notable for taking the movement throughout the world, especially in English speaking countries. The final group to emerge from the "great awakenings" in North America was Pentecostalism, which had its roots in the Methodist, Wesleyan, and Holiness movements, and began in 1906 on Azusa Street, in Los Angeles. Pentecostalism would later lead to the Charismatic movement. Restorationism refers to various unaffiliated movements that considered contemporary Christianity, in all its forms, to be a deviation from the true, original Christianity, which these groups then attempted to "Reconstruct", often using the Book of Acts as a "guidebook" or sorts. Restorationism developed out of the Second Great Awakening and is historically connected to the Protestant Reformation, but differs in that Restorationists do not usually describe themselves as "reforming" a Christian church continuously existing from the time of Jesus, but as restoring the Church that they believe was lost at some point. The name Restoration is also used to describe the Latter-day Saints (Mormons) and the Jehovah's Witness Movement. Fascism describes certain related political regimes in 20th century Europe, especially the Nazi Germany of Hitler. In his encyclical Non Abbiamo Bisogno, Pope Pius XI declared that Fascist governments had hidden "pagan intentions" and expressed the irreconcilability of the Catholic position and Fascism, which placed the nation above God and fundamental human rights and dignity. Many Catholic priests and monastics were persecuted under the Nazi regime, most notable the concentration camp victims Maximilian Kolbe and Edith Stein (Saint Teresa Benedicta of the Cross). Furthermore, many Catholic laypeople and clergy played notable roles in sheltering Jews during the Holocaust, including Pope Pius XII. Various incidents, such as giving aid to downed Allied airmen, nearly caused Nazi Germany to invade the Vatican before the liberation of Rome in 1944. The relationship between Nazism and Protestantism, especially the German Lutheran Church, is complex. Though the majority of Protestant church leaders in Germany made little comment on the Nazis' growing anti-Jewish activities, some, such as Dietrich Bonhoeffer (a Lutheran pastor) were strongly opposed to the Nazis. Bonhoeffer was later found guilty in the conspiracy to assassinate Hitler and executed. Fundamentalist Christianity, is a movement that arose mainly within British and American Protestantism in the late 19th and early 20th centuries in reaction to modernism and certain liberal Protestant groups that denied doctrines considered fundamental to Christianity yet still called themselves "Christian". Thus, fundamentalism sought to reestablish tenants that could not be denied without relinquishing a Christian identity, the "fundamentals": the Bible as God`s word, viewed as the sole source of authority, the virgin birth of Christ, the doctrine of atonement through Jesus, the bodily resurrection of Jesus, and the imminent return of Christ. Ecumenism broadly refers to movements between Christian groups to establish a degree of unity through dialogue. "Ecumenism" is derived from Greek οἰκουμένη (oikoumene), which means "the inhabited world", but more figuratively something like "universal oneness". The movement can be distinguished into Catholic and Protestant movements, with the latter characterized by a redefined ecclesiology of "denominationalism" (which the Catholic Church, among others, rejects). Concerning the Greek Orthodox Church, steady movement was made to reconcile the East-West Schism. On 30 November 1894, Pope Leo XIII publishes the Apostolic Letter Orientalium Dignitas (On the Churches of the East) safeguarding the importance and continuance of the Eastern traditions for the whole Church. On 7 December 1965, a Joint Catholic-Orthodox Declaration of His Holiness Pope Paul VI and the Ecumenical Patriarch Athenagoras I was issued lifting the mutual excommunications of 1054. Concerning Catholic relations with Protestant communities, certain commissions were established to foster dialogue and documents have been produced aimed at identifying points of doctrinal unity, such as the Joint Declaration on the Doctrine of Justification produced with the Lutheran World Federation in 1999. Ecumenical movements within Protestantism have focused on determining a list of doctrines and practices essential to being Christian and thus extending to all groups which fulfill these basic criteria a (more or less) equal status, with perhaps one's own group still retaining a "first among equal" standing. This process involved a redefinition of the idea of "the Church" from traditional theology. This ecclesiology, known as denominationalism, contends that each group (which fulfills the essential criteria of "being Christian") is a sub-group of a greater "Christian Church", itself a purely abstract concept with no direct representation, i.e. no group, or "denomination", claims to be "the Church". Obviously, this ecclesiology it at variance with other groups that indeed consider themselves to be "the Church". But moreover, because the "essential criteria" generally consist of belief in the Trinity, it has resulted in strife between these Protestant ecumenical movements and non-Trinitarian groups such as Latter-day Saints (Mormons) and Jehovah's Witnesses, which are not often not regarded as Christian by these ecumenical groups. This page was last changed on 27 November 2014, at 07:34.